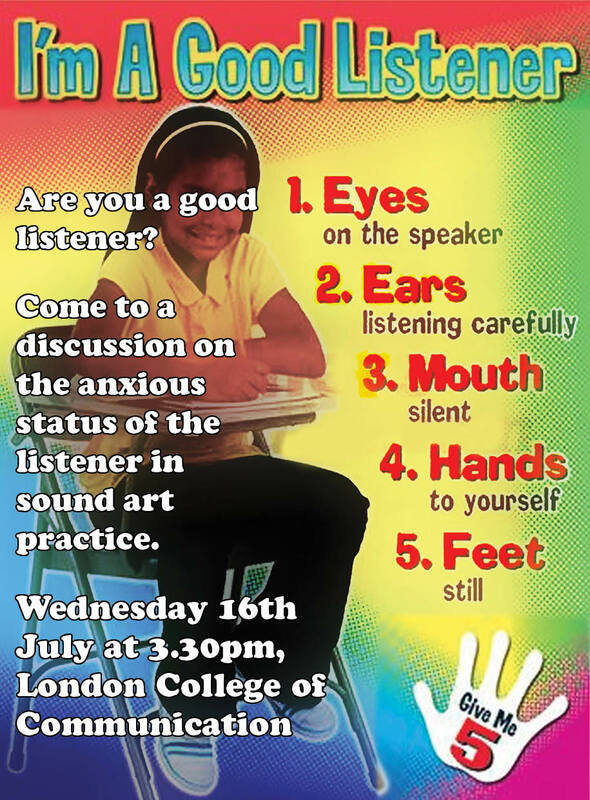 Artist Dan Scott invites you to participate in a choreographed discussion about the various hierarchies, pedagogies and anxieties of listening within sound art practice. The discussion will be prompted by a number of short performative, audiovisual and textual provocations drawing on various sources including psychoanalysis, sonic branding and early self-help guides. In a postmodern world is a listener free to respond to and understand sound as they hear fit? Or do the sound arts infer the existence of a ‘good’ listener, someone who (through practice, education and effort) hears the world more deeply, profoundly or musically than others? What anxieties do these conflicting positions cause in a listener? Following philosopher Gemma Corradi Fiumara’s proposition that listening is the necessary and undervalued other half of discourse and debate I’m A Good Listener utilises conversation as listening practice. The session is open to anyone with an interest in listening from sound art and beyond to share approaches, ideas and experiences. The intention is not necessarily to find resolution but, instead, to recognize discussion, critique and ‘being heard’ as crucial aspects of a healthy listening practice within the sound arts. Dan Scott is an artist and PhD candidate with CRiSAP at the London College of Communication.